Coca Cola Tu Full Song Lyrics with English Translation and Real Meaning Explanation from upcoming Bollywood movie Luka Chippi, the groovy song is a remake song from Tony Kakkar, the new song has different lyrics though, the song is composed by Tony Kakkar with additional music by Tanishk bagchi, while Lyrics is penned by Tony Kakkar & Mellow D, Coca Cola from the movie Luka Chippi is sung by Tony Kakkar & Neha Kakkar while Young Desi has sung the RAP portion of the song. The music is available under the label of T-Series. The audio mp3 version of Coca Cola remake from Luka Chippi is free to download and stream from Gaana, Wynk Music, Hungama, JioSaavn and other online music portals. 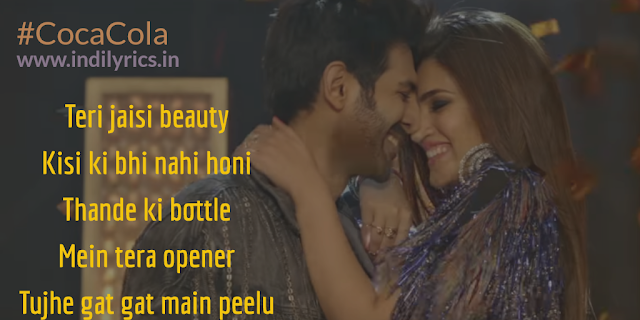 The movie Luka chippi stars Kartik Aaryan & Kriti Sanon in lead roles.